Update: SOLD. Thanks to all who were interested. 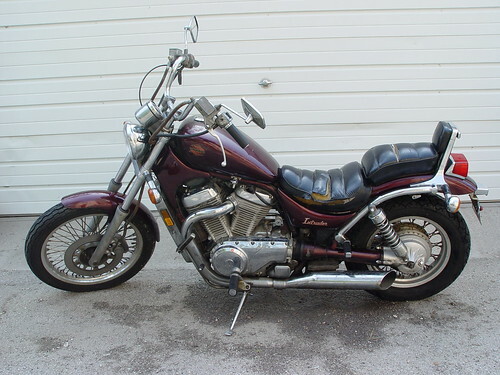 For sale: my 1986 Suzuki Intruder. This is a great bike -- it's always run solid and it's a comfy bike to ride. Great for couples -- Erica likes the queen seat (she doesn't feel like she's going to slip off, like she does on crotch rockets, and she can sit uprightish). I rode the bike a lot for general transportation around Chicago, but we got a car and so I just don't ride it enough anymore to justify the space it's taking up in Shaun's garage. The bike is not currently running -- it was running fine two years ago and then I put it into storage. I'm very confident that it's just that the battery is dead (that is one of the few annoyances of this bike -- the battery is in an awkward place and you really need a stand to get it out) but I should note that I'm selling it as-is. I added some of that tank stabilizer stuff to the gas tank before it went into storage. Either Shaun or I has owned the bike for the last eleven years (he gave it to Erica and I as a wedding present three years ago). In that time it's been laid it down just once -- a nice slow topple at 5 mph at a rainy stop sign. That resulted in a scratch across the gas tank and a bent handle bar that Champion Cycle straightened out for me. I'm also always dinging the turn signals as I get it in and out of the garage. They're easy to replace, and also easy to bandage up with electrical tape (which is what they are right now). Other than that, no accidents. And the bike has been living in a garage for the last five years, protected from Chicago winters and summers. I've got a whole gallery of photos up at Flickr so you can see the bike from all sides. How does $700 sound? Questions? Give me a holler!